Microwaves are Electromagnetic waves having much higher frequencies about range of 1 GHz to 1000 GHz and having wavelengths ranging from as long as one meter to as short as one millimeter. Generally, Microwaves includes the whole super high frequency band (SHF Band) having frequency range from 3 GHz to 30 GHz. With the development of Microwave Technology, the problems of long distance communication circuits appear virtually solved. Microwave can provide large block of circuits at low prices. Microwave Technology is used in point to point communication. It has many advantages over convectional Radio Communication. As we stated above, Microwaves Waves have higher frequencies, these high frequencies make them suitable for allocation of broad bandwidth and high data flow. Microwave frequencies also allows to decrease the size of Antenna. As the size of Antenna is inversely proportional to the frequency, so as frequency increase, the size of antenna decreases.Microwave Technology is in TV, Radio transmissions for transmitting data from Earth Stations to Satellites. Microwaves are also used in Microwave Ovens and in RADAR (Radio Detection and Ranging). Have you ever wondered How Microwave Works? Its also based on Micro waves. The Microwaves Frequency Band Table is shown in the picture below. As we already stated that Microwaves are Waves having Frequency from 1 GHz to 1000 GHz, but we does not utilize the whole Microwave Frequency Range . 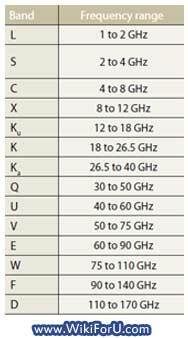 Mostly used Frequencies are 1 GHz to 40 GHz as shown in the Microwave Frequency Chart.